Everyone makes purchases they regret. You might buy an expensive toy, binge on cartons of ice cream, get a fancy dress, or you might buy too many copies of a Top Gun video game. On March 23rd, games archivist and Video Game History Foundation director Frank Cifaldi noticed an unusual auction on eBay. 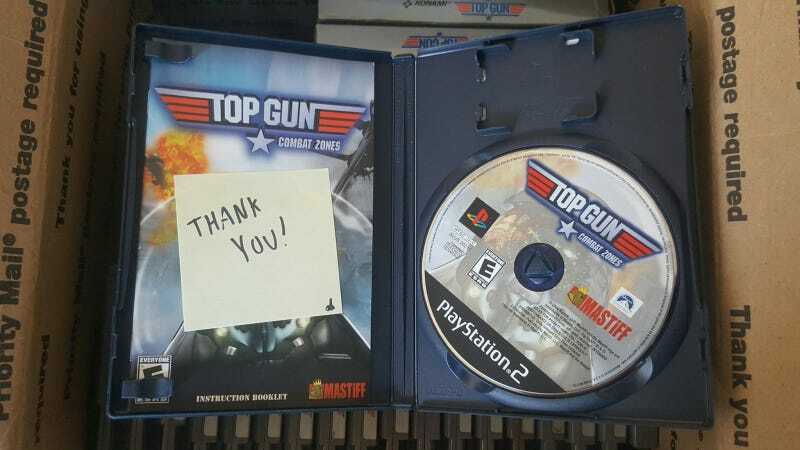 The listing contained 20 unboxed copies of Top Gun for the NES, 2 boxed copies, 2 Famicom copies, 13 copies of Top Gun: The Second Mission, and one copy of Top Gun: Combat Zones for the Playstation 2. It also included copies of the film on VHS and laserdisc, as well as a handwritten letter from the seller. The listing recalled another well known auction for a fridge filled with Jurassic Park games. It’s a bizarre collection that could have been little more than an oddity until it was purchased by game engineer Chris Larkin, who works at Other Ocean Interactive. Larkin purchased the listing for for $99. “Your girlfriend cheats on you and what do you know - you suddenly own way too many copies of Top Gun,” Forgham said. The tragic nature of Forgham’s collection and his subsequent difficulty selling it lead Larkin to believe the collection was troubled. “I like to think that the collection carries some sort of curse that binds its owner into continually collecting more and more for no real particular reason,” Larkin said. Larkin has since placed the collection behind his desk at the Other Ocean offices and hopes that it may pass into someone else’s hands in time. The carts lay arranged in a miniature shrine, with the chief position reserved for a used copy with the title written on in marker. He’s also received additional donations and offers for new Top Gun merchandise to add to the collection, including a pachinko machine. “I think it says something deep about our collective cultural yearning for our media to be tangible again,” Cifaldi said. Whether this compulsion to collection random media speaks to something greater is hard to say. One thing is certain: with that display of charity, Larkin was one hell of a wingman.